This Tamarind chutney is well known all over South India. The fresh and bitter taste of the tamarind gives many dishes a very special taste. 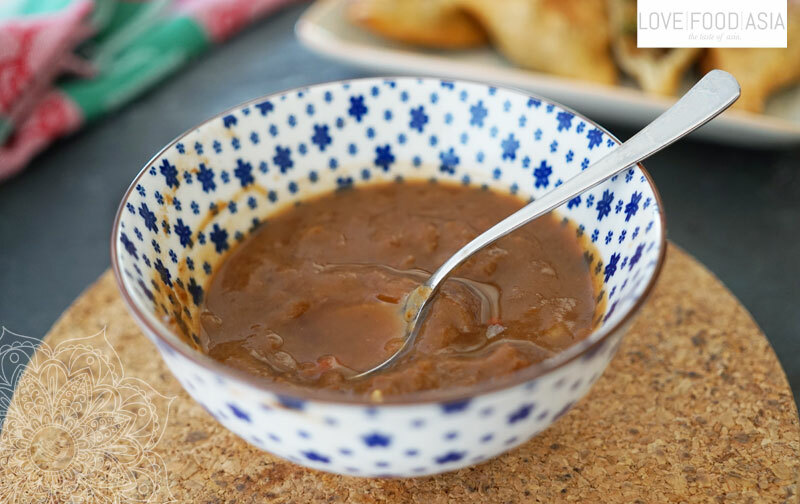 This sweet and sour mixture is more like a sauce than a chutney and is the perfect dip to Samosas. In a small pot heat tamarind and water. Bring to a boil and reduce heat to low. Simmer, stirring constantly, for 20-25 minutes. Use a sieve to and a wooden spoon to transfer tamarind-water mixture into another small pot. Stir in chili, sugar and salt and simmer for another 10 minutes. Taste with more sugar or slat if necessary. Let it cool and serve. It keeps fresh for 3 days in the fridge. You also can freeze the mixture easily. We are interested in your opinion. Have you tried this recipe? Let us know how you liked it. Make a comment, rate it or post your own photo with #lovefoodasia on Instagram. Thanks for your support!